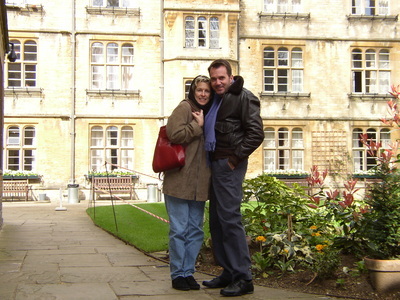 2007 Oxford - James W. Lett, Ph.D. These photographs and notes are from our trip to Oxford in March, where I presented a quasi-academic paper at the Oxford Round Table, an invited gathering of scholarly tourists (or perhaps touristic scholars). 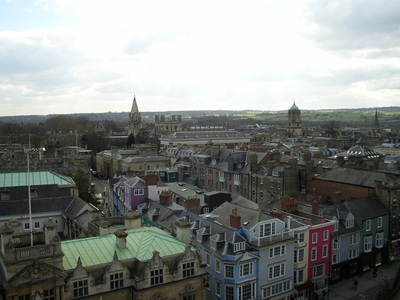 This view of the town of Oxford is from the medieval tower of St. Mary the Virgin Church, the official church of Oxford University. The tower is one of the oldest parts of the building and dates from the early 14th century. 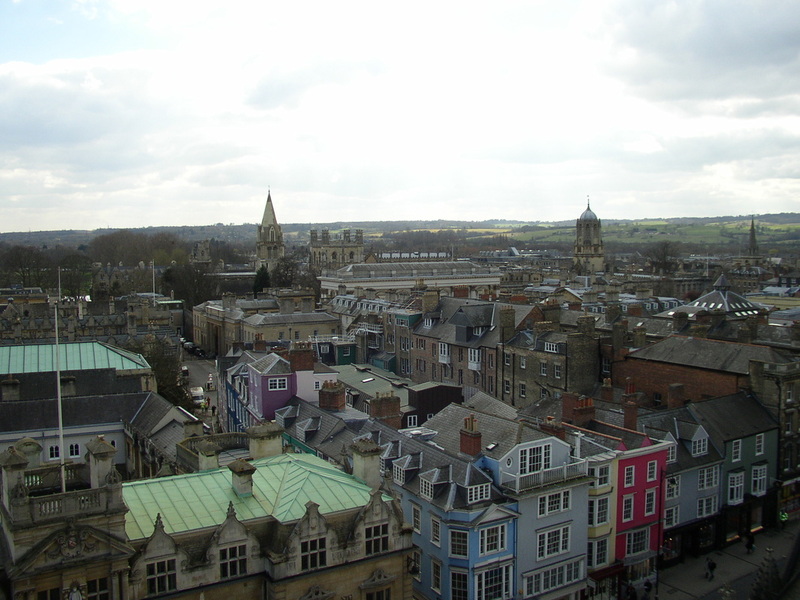 This view of All Souls College is from the tower of St. Mary's Church, looking east-northeast. 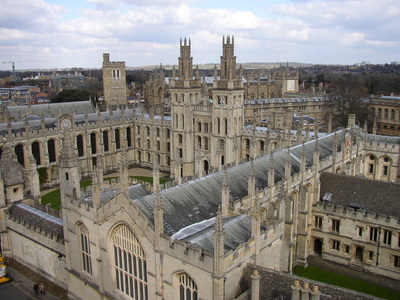 All Souls was founded in 1438 by Henry VI. Radcliffe Camera is the most distinctive building at Oxford University and its most famous landmark. 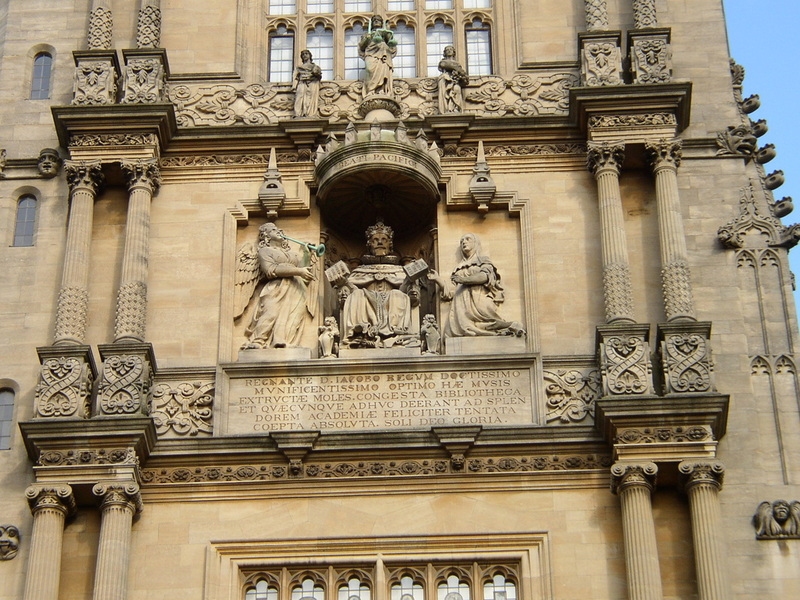 It's named for Dr. John Radcliffe, an 18th century physician who left money in his will for the construction of a library near to, but not part of, the Bodleian Library. 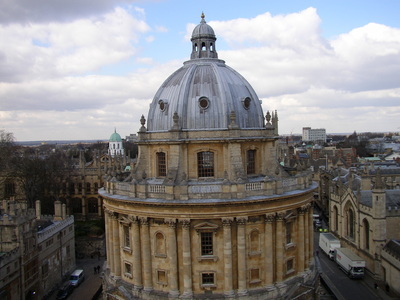 It was taken over by the Bodleian in 1860, however, and today serves as a reading room. The Tower of the Five Orders rises above the Great Gate at the entrance to the Bodleian Library, and houses the archives of the University. 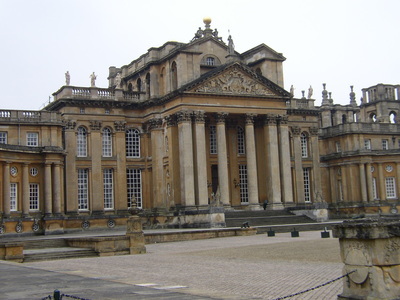 The Tower features the five classical orders of architecture (Tuscan, Doric, Ionic, Corinthian, and Composite), starting at the lowest level with the most ancient (the Ionic and Corinthian are visible in this photograph). The Divinity School, a masterpiece of Gothic architecture, was Oxford University's first examination school--until the 19th century, the Professor of Divinity supervised the oral examination of candidates in this room. The wooden chair against the right wall in the center of the picture was made from the timbers of the Golden Hind, the ship sailed by Sir Francis Drake when he became the first Englishman to circumnavigate the globe in the late 16th century. There are 39 self-sufficient colleges at Oxford University, each with its own dining hall. This one at Jesus College is typical, with the high table & chairs for the faculty on an elevated platform at the end of the room, and long tables & benches for the students running perpendicular to the high table. 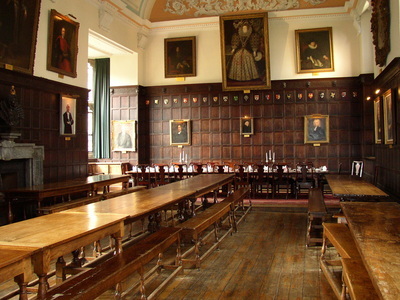 The portrait of the college's founder (in this case Queen Elizabeth I) usually hangs over the center of the high table. 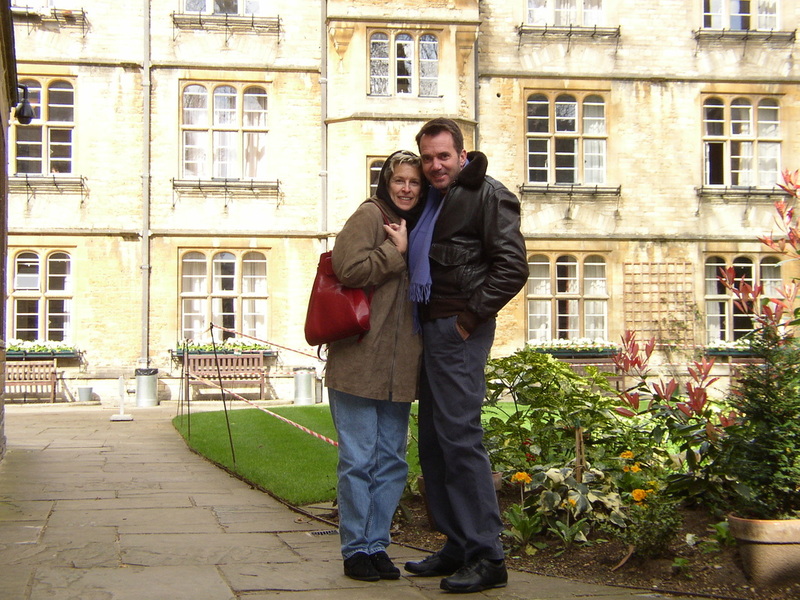 As delegates to the Oxford Round Table, we stayed for five days in a dormitory room at Lincoln College, one of the best preserved of the medieval colleges. 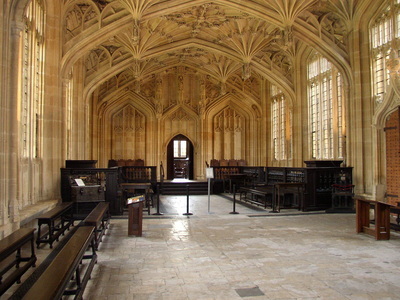 Founded in 1427, the dining hall still has its original roof, including the gap where smoke used to escape. Our room overlooked this small quad, accessed through a vaulted archway from the front quad. 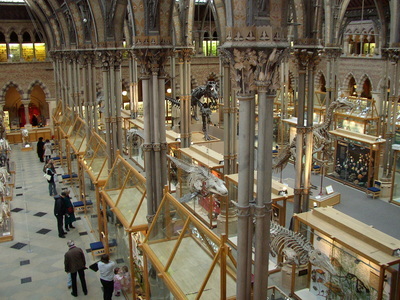 The University Museum of Natural History at Oxford, housed in a Victorian building with cast-iron columns and a glass roof, has many intriguing exhibits, including a stuffed dodo, the flightless bird from Mauritius that became extinct in the 17th century. The dodo appears famously in Lewis Carroll's book Alice in Wonderland. Carroll's real name was Charles Dodgson, and he was a lecturer in mathematics at Oxford. This is the Half Moon at Cuxham in Oxfordshire where we had one of several outstanding pub lunches during the week. 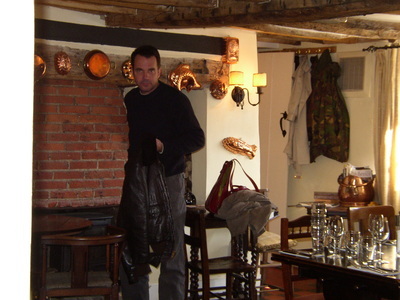 The food at numerous English pubs is excellent, and the atmosphere is almost invariably quaint and delightful.